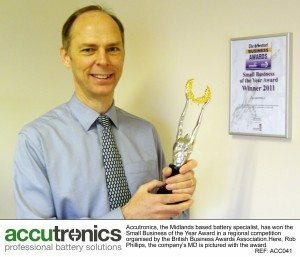 Accutronics, the Midlands based battery specialist has won the Small Business of the Year Award in a regional competition organised by the British Business Awards Association. The company was awarded the trophy at a ceremony held at King’s Hall in Stoke on March 27, 2012. This prestigious award recognises Accutronics’ exceptional performance in areas such as product innovation, new market development, strategy and management. The accolade is an acknowledgement of the company’s success, having transformed itself, under new ownership, into a profitable multi-million pound turnover British owned company in just two years. An expert in the design, development and manufacture of rechargeable batteries for high performance electronic devices, Accutronics’ smart batteries offer advanced functionality and features such as charge control, fuel gauging and device communication. The company exports more than 90% of its products and offers whole of life support for OEMs (Original Equipment Manufacturers) and design consultants who demand a high level of technical and commercial expertise. “Winning such a prestigious business award is a vote of confidence for any British manufacturer, particularly a young business such as Accutronics”, enthused Rob Phillips, managing director at Accutronics. “The selection process was very thorough and the questions we had to answer touched on every aspect of the business”. “This is a great achievement for Accutronics, especially as it’s the first time we’ve put ourselves forward for an award,” continued Phillips. “We are all delighted and I am personally grateful to the dedicated and experienced individuals I work with every day,” he concluded. This entry was posted in Power Supplies & Batteries, UK. Bookmark the permalink.